Nicola Hotel v Atény, Řecko: Zarezervujte nyní! 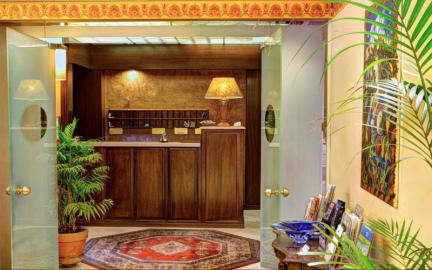 Nicola Hotel is a family owned quiet and friendly hotel offering a home away from home accommodation. It is located very close to Pedion Areos park, the 2nd biggest park in Athens and quite close to Athens city centre. The major facilities that the hotel offers are free parking and free Wi Fi. Additionally, guests can make use of the computer in the lobby or relax with a drink at the bar or on the open-air terrace. 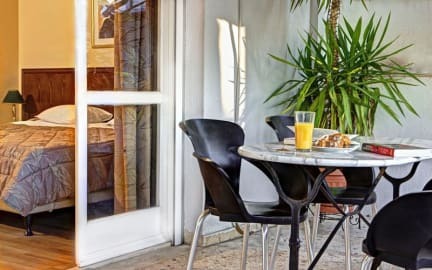 The hotel is decorated in the traditional style of the city and the front desk operates around the clock to offer Greek hospitality to their guests. Guest rooms offer all basic facilities like flat screen TV, safe deposit box, air conditioning, hairdryers, magnifying mirrors, wi-fi access, and en-suite bathroom. Majority of rooms offer private balconies. Daily maid services are guaranteed. For those who want to flavor breakfast, we serve on a daily basis freshly produced products in a buffet style at the breakfast room. From Nicola Hotel guests can use public transportation to reach the National Archaeological Museum, the business centre and shopping area.